Eight years have gone by since Joy Malinowski established the Cooper House Bed & Cocktail in historic Thomas, West Virginia. Those of us in the Tucker County tourism industry did not predict this would be the beginning of a cult following based upon overnight accommodations—a Cult of Joy! 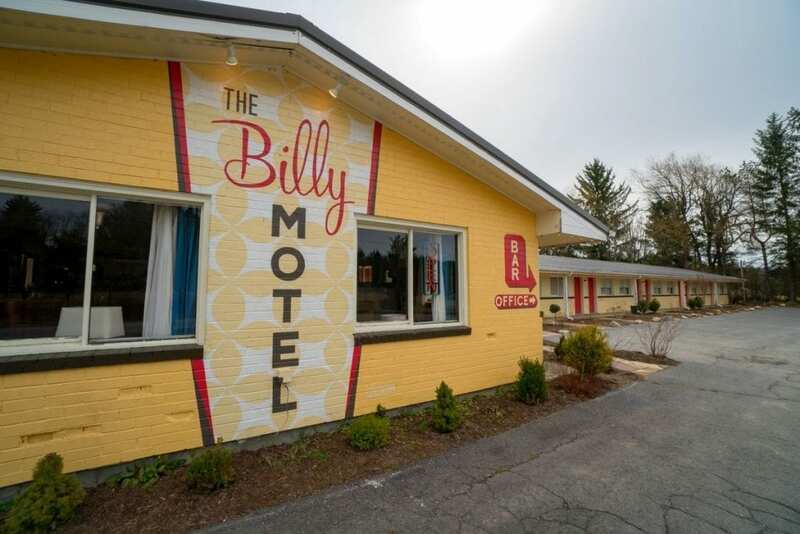 Her avant-garde attitude toward travel has since resulted in a second remarkable lodging option in nearby Davis, West Virginia—The Billy Motel & Bar, which replaced the old Mountain Aire Lodge across from the entrance of Blackwater Falls State Park. Guests receive a Billy Bar token. Joy is part of the transplanted entrepreneurial “cult” taking Davis and Thomas by storm, establishing breweries, art galleries, restaurants, and shops. 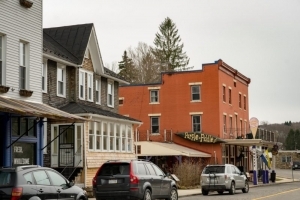 Originality and hard work have made Front Street in Thomas a modern-day success. When Joy purchased the Cooper House, she took a big ol’ chunk out of “original” with the first bed-and-cocktail. Is it the first bed-and-cocktail in the nation? As far as I can find, yes! And it doesn’t hurt that it’s located next to the Purple Fiddle, which many consider to be a premier music venue in West Virginia. A century ago, coal shaped Thomas and its population of more than 3,500 residents. Today, it’s a genuine small town of 650 that’s experiencing quite a renaissance. The Cooper House is a 129-year-old residence—once home to Dr. Hoffman, whose surgical center and pharmacy building remain next door. Inside you’ll find a warm, inviting ambiance full of natural light. 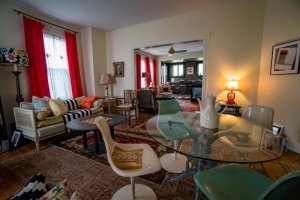 Its common areas, kitchen, and cocktail zone are classy with just enough period accessories emphasizing Appalachia. Four bedrooms, each with a private bathroom, are available year-round. Reservations are highly recommended on any weekend. Remember that there’s a cult following and only one bed-and-cocktail in the lower 48 states that I can find. Guests at the Cooper House are close to all activities in Thomas. Two miles south of the Cooper House in the historic lumber town of Davis, The Billy Motel now dishes out the same outside-the-box attitude but on a bigger scale with a hip retro colors and interior design and an appreciation for the arts. One might expect a certain clientele, and I have seen members of sporty car clubs as well as outdoor-adventure seekers with over-packed roof racks fill the 10-room motel most every weekend. 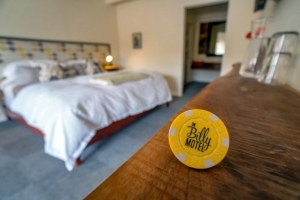 Check-in at The Billy comes with an atypical complimentary drink token for an impressive, fully-stocked bar. French-press coffee is served every morning on the house. You’re not going to get the “Folgers” treatment when in the Cult of Joy. Five employees along with Joy oversee the operations seven days a week and pour libations for the public five days a week. If exquisite cocktails that ooze sophistication are your trip, The Billy Bar serves them up on the regular. For under-21s and sin-free folk, bartenders whip up classy “mocktails” that keep the vibe flowing. Let me tell you about the advantages of each establishment from a local’s perspective. Guests mingle over cocktails at the Cooper House. The Cooper House is located next to the Purple Fiddle. National acts regularly visit the fiddle, and local beats are as original as the Appalachian Mountains are old. Thomas art-walk events have now expanded on Front Street’s shops and art galleries with regular frequency and have essentially become street parties imbued with the welcoming Thomas brand of flair. Wear yourself out in the woods by day and in Thomas by night: the Cooper House Bed & Cocktail is always in sight. Lindy Point near Thomas, W.Va.
Davis, now home of The Billy Motel, is known as the gateway to adventure, and more than 100 miles of trails await outside your doorstep, including those in the Canaan Backcountry, at Blackwater Falls State Park, and in the Moon Rocks trail system. Also, doggy guests have access to three acres on which The Billy Motel located. I cannot tell you how much I have enjoyed using the word “cult” in this article. Joy and I had some belly laughs playing with the terms “Joy of Cult” and “Cult of Joy” when I first asked about her loyal and committed following. Will you be part of the cult? I can only hope so. It’s good, really good. The Billy Motel and Bar, Joy Malinowski, infuses the past with new flair. Find out more about the region at the Tucker County Convention and Visitor Bureau. Writer and photographer Brian Sarfino is a resident of Davis, West Virginia and the marketing manager for the Tucker County Convention and Visitor Bureau. A passionate mountain biker and outdoor adventurer with a weakness for adrenaline-fueled activities, he moved to the area in 1994 as a student at Davis and Elkins College and has since suffered seven broken bones and five major surgeries. 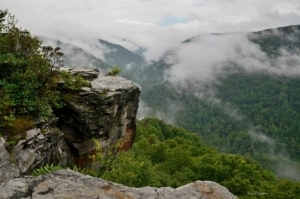 AirBnB to support furloughed federal employees in W.Va.